Puri Saron is the Nestled amid the hillside and the famous beach of Senggigi Lombok, Where the colorful boats line the shore, and the ocean fresh breeze comes in the genuine touch. The other way to reach Puri Saron easier is by fast boat. 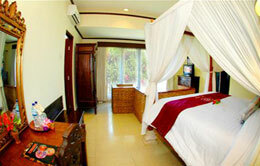 You will be transferred from Bali to Telu Nare Lombok around one and half hours. The hotel’s atmosphere and features is offering an auspicious occasion where your premises can be seen from the well designed room, which is blended in harmoniously natural decor of furnishing. 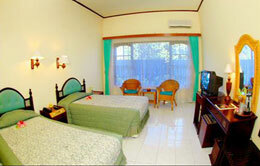 The Hotel presents variety ingredients for the comfortable diving experience. 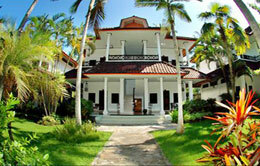 Puri Saron offers 25 Superior Room, 16 Deluxe Room, 4 Bungalows, 4 Suites and 2 meeting rooms. Puri Saron is available for the meeting program maximum 60 persons. 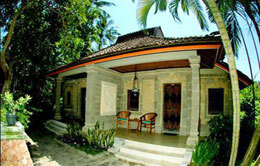 The spacious suites are equipped with all comfort you may expect like diving table, your own private seat with couch, king-size bed in Balinese style with curtain against the mosquito’s, mini bam air conditioning, room to room telephone, bathroom with shower and bathtub, cold and hot running water, satellite television, dressing table, The suites have beautiful sea and garden view.